When it comes to personal watercraft, the real fun starts in the water. But how can you get there faster and easier? BRP’s Move Trailer Family surpasses the competition with never seen before industry firsts that allow consumers to spend less time on the ramp and more time in the water. Safe, fast and simple to use, the Sea-Doo MOVE Trailer lineup includes 7 trailers (5 simple and 2 double) build to fulfill every one of your needs and your budget. -Release the safety lock on the front of the watercraft. -Get on your watercraft and get ready to go. -Unlatch the iCatch handle. This will release the watercraft so it can easily glide off the premium roller ball system and into the water. -Ride off and spend the day on the water! It is just that easy! After you have spent the day on the water, loading your watercraft back onto the trailer is just as simple. -Position your trailer at the ramp. -Ride your watercraft onto the trailer, the roller balls will glide your PWC to its intended position. -Fasten the safety lock on the front. -Fasten the safety lock on the front of the watercraft. -Drive off the ramp and soon you will be on your way! The Sea-Doo MOVE I with iCatch™ carries a single watercraft and the Sea-Doo MOVE II is a double trailer system. The Sea-Doo Move I also includes a premium version that includes iCatch and a Walk pad guidance system that allows you to conveniently walk around the trailer to easily access your PWC. Visible under water, the walk pad system doubles as a guidance system for trouble free mooring process. 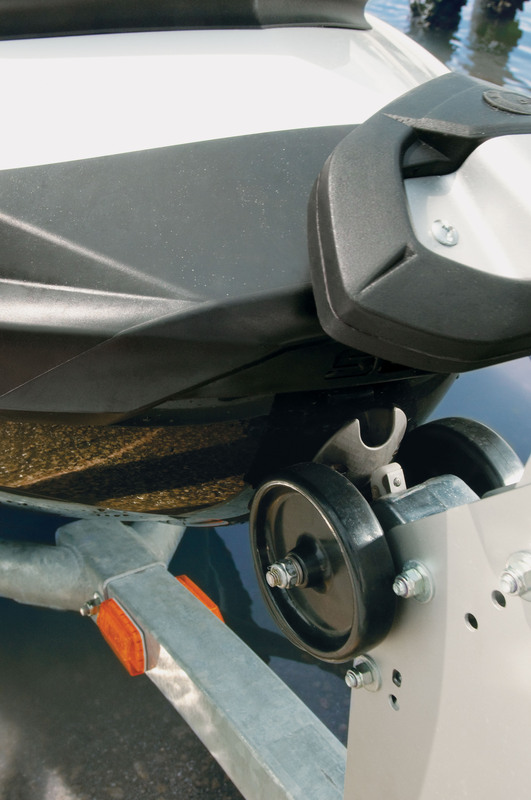 All Sea-Doo trailers include fully adjustable carpeted bunks (side-to-side and front-to-back) that allow you to change the bunk angles to fit all PWCs. The custom frame design requires less water to load and unload watercraft, include leaf spring or torsions suspension, and come in galvanized or black painted options. CLICK HERE to download a brochure with additional information on the Sea-Doo MOVE trailer family. The only downside to that trailer is when you want to install or remove your cover on the pwc. Otherwise it is perfect.